As competition increases for IT service providers, it's important to find new ways to solve problems for your clients, keeping you as their trusted technology advisor. However, it's hard to deem yourself an expert at everything that's available today. There's a lot of time that goes into learning new skills, let alone how to properly price and market them to clients. With running your business taking up the majority of your focus, it would be nice to have someone else help you broaden your service offering, wouldn't it? If you've ever thought of offering VoIP to your clients, that task just got easier. 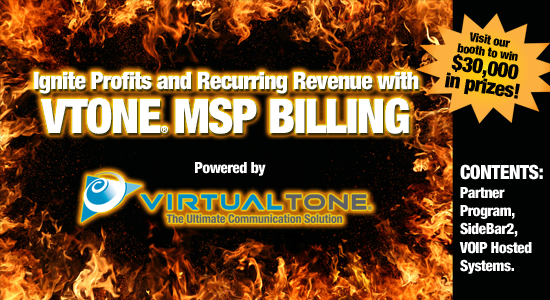 VirtualTone is the premier VoIP solution for the IT Nation. VoIP is a no-brainer solution you can include in your managed service contracts, because what business doesn't have or need a phone? As your clients' trusted technology advisor, there's no reason why you shouldn't be handling a service that's crucial to running their business.